Q) Which Post Codes are Free Local Delivery? A) We offer Free Local Delivery on all local orders over £60.00 to BL1, BL2, BL3, BL4, BL5, BL6 & BL7, BL11 & BL78, PR6 & PR7, WN1, WN2, WN3, WN4, WN5, WN6 & WN7 post codes. Order online or over the phone – ring (01257) 475914 – Open 7 Days – (Sunday til 1.00pm). (Cash on delivery only if order placed over the phone). If you order online and your order is eligible for a free local delivery we will contact you with a delivery date or please ring us if you have a day that best suits you. Q) Do you deliver Nationwide? A) Yes. We use Palletline 2 Day Economy Nationwide Delivery Service (delivery areas exclude the Highlands and Islands). Delivery will be Monday to Friday (excluding Saturday, Sunday and Bank Holidays). You will be contact via email to confirm the delivery day once your order has been dispatched (usually within 1 to 2 days), we request delivery between 10.00am and 4.00pm and that the driver rings 1 hour before delivery, a signature will be required. You must notify us via email or phone (01257) 475914 if you have any access issues as we can request delivery on a smaller vehicle. Q) Can I collect an order from you? A) Yes. Order online and choose the click and collect option or ring us on (01257) 475914 – place your order over the phone and collect at a time that suits you – Open 7 Days – (Sunday til 1.00pm). We will contact you when your order is ready for collection if you order through the website. (Cash on collection only if order placed over the phone). Q) Can I order over the phone? A) You can place an order over the phone for local delivery and collection on 01257 475914 – the minimum telephone order for local delivery is £60, there is no minimum for collection. (Cash on delivery and collection only for orders placed over the phone). Q) Why should I use Kiln Dried Logs? A) When choosing wood for burning the most important factor which has a significant effect on the amount of heat produced is the moisture content. Any water in the timber has to boil away before the wood will burn, this significantly reduces the heat output and creates lots of tars and smoke, these tars are corrosive causing potential damage to the flue lining and increasing the risk of a chimney fire. Kiln Dried Logs burn hotter and more efficiently, you will use fewer dry logs to achieve the same heat output as seasoned logs. Q) How can I tell if the Logs are dry? A) The Logs will feel lighter and make a hollow sound when tapped together, radial cracks will be visible in the ends of the Logs and the bark will come off easily. Q) Which is better – Hardwood or Softwood Logs? A) Hardwood tends to be more dense and so heavier in weight, generally Hardwood will produce more heat and burn hotter than Softwood. You may need to burn fewer Hardwood Logs but Softwood Logs are easier to light and great if you want a fire with a lower heat output perhaps in Spring and Autumn. Q) How are the Briquettes held together? A) The Briquettes are produced by compressing the wood to a calculated pressure of 1700 kg/cm2, this releases a natural substance in the wood called Lignin, the Lignin acts as a natural glue binding the wood together ensuring that the briquettes do not fall apart, no binding agents, additives or adhesives are used in the manufacturing process, therefore producing a completely clean organic fuel, the lower the moisture content (ours are below 10%) the better the Briquette holds together and the hotter they burn. 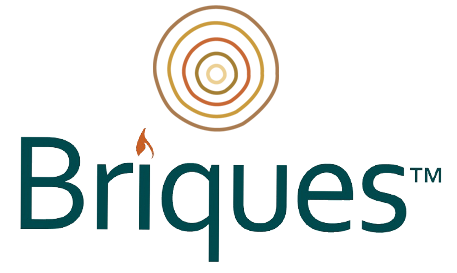 We produce our own Briquettes from locally sourced virgin wood. Q) What does BSL mean? A) The BSL (Biomass Supplier List) is a list of all registered and Authorised Suppliers of Approved Fuels. If you are a domestic or commercial customer claiming the RHI (Renewable Heat Incentive) from October 5th 2015 you will have to purchase your fuel from an Authorised Supplier to be able to claim your RHI otherwise payments may be withheld.